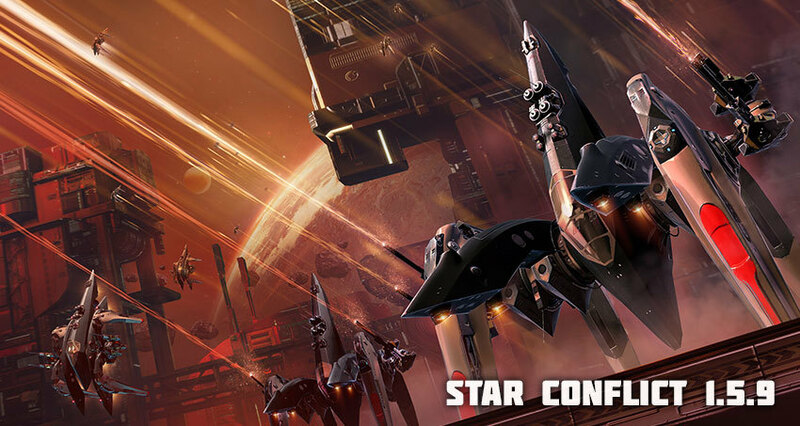 Stargem Games and Gaijin Entertainment have released a significant content update for their F2P online space MMO game Star Conflict, concluding a series of changes and improvements brought this autumn. The new update adds new content and reportedly brings more rewards to players. Let’s see how. Star Conflict Update 1.5.9 adds the Pilgrim, the first ship in Star Conflict that lets you perform an emergency landing, a quick landing on the surface of a planet or station. The ship also has its own mechanics with an energy re-allocation system that transfers unused energy into extra shield, range and firepower. While the ship will be available for a limited time (until mid-December) using premium currency, namely Galactic Standards, which would be too hard to get in-game before that time if you were to start now, the ship will be brought back at the beginning of next year and will again be available for construction with credits and resources only, both of which can easily be obtained in-game. Players can now actually try their spaceship is a safe area in space. Using the new “Test Drive” feature, players can try weapons, defenses, flight dynamics as well as all combat modules of any ship they own or not. This makes locked content a lot more visible, interactive and transparent, offering players an effective way to assess products before they choose to invest time and/or money into them. Two new locations have been added to the 43 sectors available, extending the galaxy of Star Conflict even further. Huron is host to an abandoned base which orbits around a gas giant. Players will be challenged on their piloting skills while fighting amidst the debris of the station’s wreckage and asteroids. Terminal D is a luxuriously equipped space station with humanitarian status, located directly above the surface of an earth-like planet and offering players a beautiful view on what could be easily mistaken as the cradle of humanity – if they can spare a moment during the fast-paced combat. Brawls are a new combat mode introduced to increase gameplay features and late game interest. Brawls have special rules and victory conditions that will change every so often to constantly offer new, changing opportunities to play and win the game. Currently available in ‘Brawls’ are the modes ‘Beacon Capture’, ‘Survival’, ‘Combat Recon’ and ‘Spaceboll’. The new Star Conflict update introduces another way to collect resources and credits every time a player reaches a new level. Pilots will now receive a Premium license valid for two days as a gift. Premium licenses double the experience and rewards gained in battle and will allow new players in particular to quickly develop their fleets and explore the most distant corners of the galaxy. Considering that Star Conflict isn’t really pay to win, as anyone can get any ship and upgrade it without resorting to paid micro transactions, these extra rewards provided by Stargem Games and Gaijin Entertainment are a nice treat made to boost access and enjoyment.